Vella Terra, now in its 4th edition, is organized by Alejandra Delfino and Stefano Fraternali. 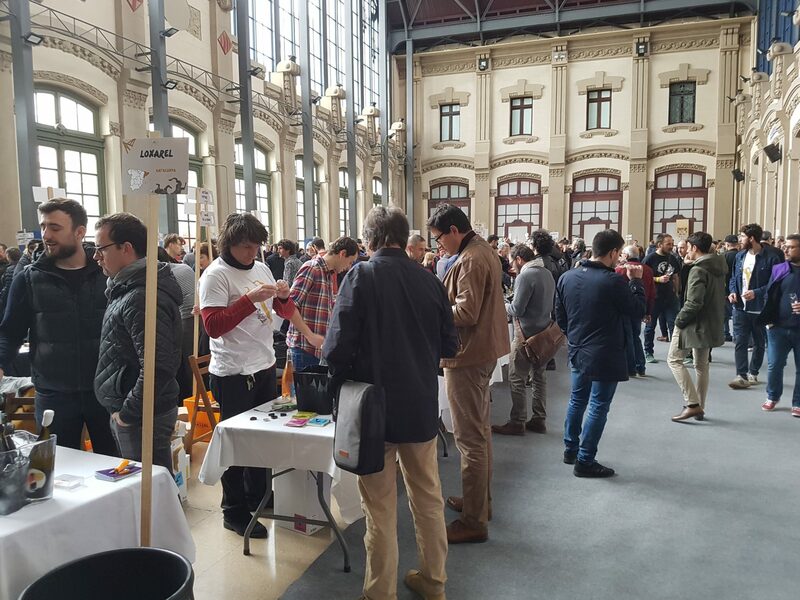 In Barcelona’s Estació del Nord there were on 10-11th February gathered more than 100 producers. In addition there were several activities linked to the fair. 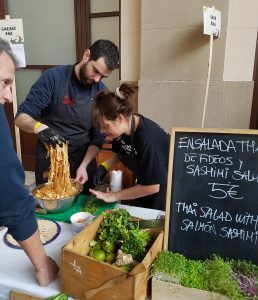 One of these was an Asian-Catalan fusion kitchen with orange wines, presented by the Casa Xica restaurant and held at the festival’s own Garage Bar, and a tasting of natural sparkling wines at the Toto restaurant. Another was a presentation of aged natural wines from the Catalan pioneers, also at the Garage Bar, where I was lucky to get a seat. I would say that this event has a more international air to it than the Vins Nus, held in the city at the same time. Here were many winemakers from Catalunya and other Spanish regions, but the features from other countries were much more evident. France, Italy, Portugal and Austria were among the well-represented places. 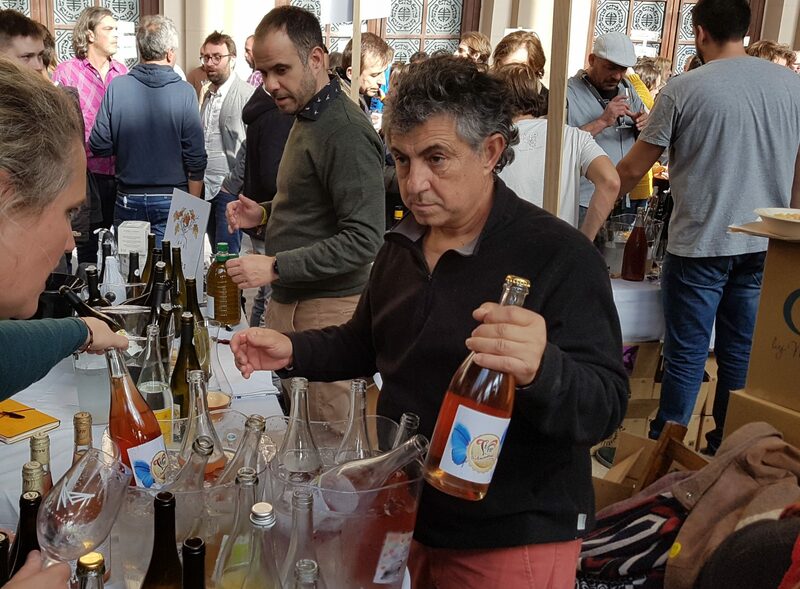 Just like the Vins Nus the objective is to raise people’s awareness of natural and organic wines, and to eat and drink healthier. Like at the other fair, the goal is to present wines made by minimal intervention. But I would say that there is a slight difference in approach, and that the producers here are, well maybe not more open, but could we say: less strict in their view of the use of SO2 (to say it simple, or maybe over-simplified). There were so many interesting, personal wines, that I can only present some highlights. And again, I will try to limit myself to one wine from each producer, though I know that again it will not be easy. While the albariños of coastal Galicia should be well-known the reds don’t have the same recognition. Forget the images you may have of dark, sturdy, bubbling, bitter wines from the old days! Now there are several producers who show how fine, elegant and cool the coastal reds can be. Two of them were represented here. I will tell more about Antonio Portela later, whom I visited a couple of weeks after this fair. Although he is not far from Cambados, where the headquarters of the Consejo Regulador of Rías Baixas is located, his farm on the Morrazo peninsula is outside the delimitations of the DO area. So he uses terms as ‘tintos marineiros’ (something like ‘reds from the sea’), he uses grapes like espadeiro branco (related to the loureiro), tinto caiño, and he is a defender of the local grape tinta femia (related to the caiño redondo). His low vineyards in or near the beaches are the most atlantic in the whole of Galicia. His red wines are from the parish of Cela in the town of Bueu, and the white wines from O Hío in the town of Cangas. They are all fresh and vivid – from the Quereres de Berobreo 2017 (called ‘viño mareiro’, mainly espadeiro blanco), with its light, green apples, citrussy fruit, via the rounder, more mellow Quereres do Hío 2017 (also viño mareiro, albariño-dominated) to the delicious, grapey Area Donón 2017. Donón is the village where the grapes grow, to the extreme west, just before you reach the island of Cíes outside the Ría de Vigo. These are practically wine from sand, from the beach. The red Namorado 2017 (tinto mareiro), fermented and aged for 12 months in used French oak, has all the virtues that this area can offer: It’s light in colour; pure, with fresh, red fruits on the nose; a vibrant flavour, a good natural acidity and in a long saline finish. As Furnias is more inland, in the Rías Baixas subzone Condado do Tea. After his studies in enology Juan González Arjones went to Barbaresco, to work with a small family producer, then also in a wine shop in Torino. Then he went back to his native Crecente to start his own project. 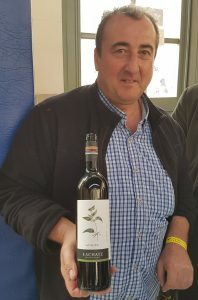 He has also been managing a vineyard for the reknowned producer Terras Gauda, nearer to the coast in the subzone O Rosal. In 2010 he planted his own vineyard down there. Pícaro 2015 was a terrific red sparkling wine from a variety of grapes (albariño, treixadura, blanco legítimo, brancellao, sousón, espadeiro), with a lovely red fruits nose (raspberry, strawberry), and some tannin. After this came a vertical of his emblematic wine, the As Furnias, in vintages 15, 16, 17, 18. This too is a multi-varietal where each grape gives its contribution; the espadeiro gives both freshness, some herb and mushroom, and some special flavour characteristics (like cherry), while the balsamic notes come from caiño longo, and the spice from the sousón. They are typically made with 12 days fermentation in steel, and with no sulphite additions. The 16 was an early picking from a hot year, but everything went right in 15. As Furnias 2015 had all the best; quite dark, inky colour; pure yellow fruits, red berries, herbs and some menthol; a good tannin structure and a wonderful acidity. In my opinion the small settlement of Nieva has long been and interesting spot on the Rueda map. This small, high altitude settlement in the province of Segovia houses producers like the Viñedos de Nieva with their excellent old pie franco vineyards, the Herrero family’s new project, not to say Ossian. Ismael was born here, and he also was involved in Ossian. But now he goes solo, and his project surpasses it all. I have covered some of his whites here and reds here. And there are several other wines mentioned elsewhere on this blog. The whites are a study in the possibilities of the verdejo grape, mostly very old and un-grafted, combined with the extreme climate of this part of Castilla. The reds include tempranillo, rufete and syrah. 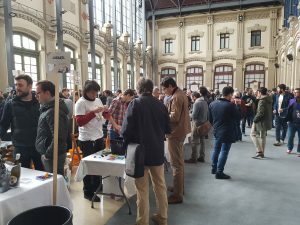 This time I tasted two pét nats, the early-harvested (and reductive wine-making) Nieva York 2018 and the younger vine (and oxidative wine-making) Correcaminos 2018, the fresh and citrussy MicroBio 2018, and the Rack 2018. For this wine Ismael has been looking for a reduction. Some gas was added to the musts fermenting in steel to raise the turbidity. No battonage. All this to keep the reduction and the wine’s selv-protection. Not a beginner’s wine, with the green-greyish colour, the cloudiness, the bubbles, the creaminess, and the acid-structured taste. Flowery, citrussy, stone-fruity too, I should add. I didn’t visit Mariano’s table that day, I just took a couple of snapshots as I went by. But later that night I was taking part in a tasting at the Bar Salvage of the Gràcia neighbourhood. I was then sitting next to Mariano and his wife, and they let me taste some wines. More about this soon. The family has a long history in wine in Lantziego, Rioja Alavesa, but it was not untill the 1970’s that they started to make their own wines. It was when Eduardo Pérez de Azpillaga Urarte started in the family company that the way towards an organic, sustainable farming began. So, in 2001 their vineyards finally got their organic certification. Maybe I liked best of all the white, non-DO Viña el Pago 2016 from garnacha blanca. It was macerated with whole bunches at 7 degrees for 72-100 hours, on stirred lees for 4-5 months. The result is a quite dark yellow wine with mature apples, some citrus, aromatic spices and a touch of dried fruits on the nose. In the mouth it’s medium-bodied with some tannin structure. The reds include a carbonic maceration wine with the same name, and an interesting clay aged wine called Fincas de Aztule 2015. Under the label Naturostean 2017 they had a dark, rich, sweet and quite alcoholic tempranillo, not from dried grapes, but with added alcohol. They stress that this was an experiment. A winery to watch. Friedrich, or Federico, Schatz of Ronda has long since established himself as one of the leading producers of table wine in Andalucía. He has been in the avantgarde of organic and biodynamic farming in the area, and uses both international and local grapes. I have visited him several times, and you can read more about his whole range here. Many will know that his wines carry one special letter that together spells his name, and as such they have become some kind of collector’s items. However, this will now come to an end. Schatz presented this time the first vintages that will come on the market without that one letter. In-stead they will carry a drawing of plants used in biodynamic farming. Other than that, the wines are the same, full of taste, with a touch of something exotic, and also with a good level of acidity. When asked I have often picked the Acinipo as a favourite, because it refers to the Roman ruins just down the road, and it’s made from lemberger, a grape from where his family can be found – and because it has been a good wine of course. This time I pick the Pinot Noir 2013 (formerly known as C), is made with 12 months of ageing in French oak on lees that has been moved a few times. It has a dark cherry colour, an aroma full of red fruits with cocoa and some aromatic spices. In the mouth it’s medium-bodied, tasty, with a lovely acidity and also with a slight bitterness in the end. The acidity can be said to come from the cool night temperatures, and it was also an extreme year with a lot of rain and snow in winter, and temperatures down to -12ºC. 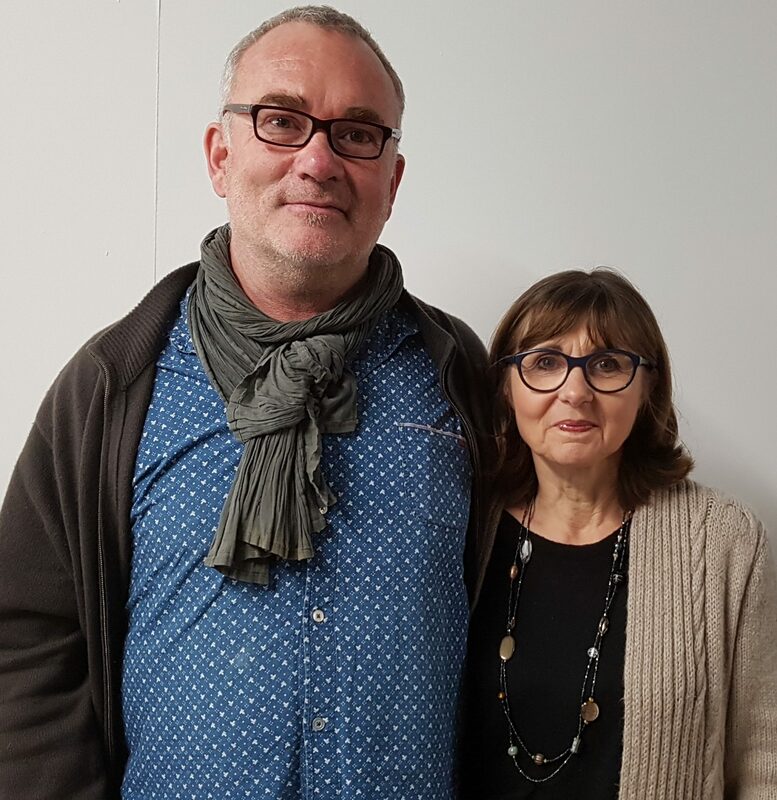 I finally got the chance to meet Jean-Phillippe of Domaine Padié whose wines I have known for some time. From Calce north-northwest of Perpignan, Roussillon, he releases one wonderful wine after another. I tasted some samples and some bottled wines. 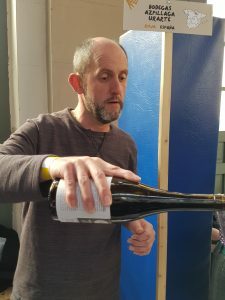 Quickly through the 2018 samples, there was the limestone-blend Fleur de Cailloux, with its yellow colour, mature apple-scent with flowery tones, full with some tannin, the light and luscious Calice, a carignan from young vines in schist soil, the juicy Gibraltar – and finally the Petit Toureau, from older carignan plants in limestone, with its ruby red colour, and very fresh fruit. Among the bottled wines I tasted the red Le Tourbillon de la Vie 2017, partly own vineyards, partly chosen from others: quite dark, luscioius, plums, red fruits, light tannin. Unpretentious, I would say, but very good. The Petit Taureau 2017, that originates from limestone marls (carignan) and schist (syrah), made with reduction in mind (both the grape varieties and the concrete vats environment). The wines was cherry red, with expressive fruit (red and dark berries), some flowers and herbs, and soft tannins in the mouth with a super and long, cool acidity. Ciel Liquide 2012, from grenache and carignan in equal proportions, from what Jean-Phillippe calls “a mosaic of terroirs” from Calce (limestone, calcarious clay and schist). and 5 years in barrels of 600 liters, 2 years in tank after that: Ligh cherry red; on the nose there is some warmth, the citrussy notes appear, also stone fruits (cherries, plums); good balance between the elements, with just enough tannins, and super acidity in a long finish. There were a couple of French producers that I didn’t know, but are worth mentioning. Les Vins Pirouettes were represented by Vanessa Letort. 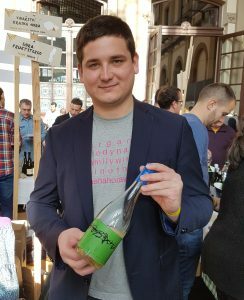 They are winemakers from Alsace who work in close collaboration with around ten small producers, all working organically, some with biodynamics – each producers with his characteristics. Some of the most interesting wines were made by Stéphane Bannwarth, who is based in Obermorschwihr, south of Colmar. There was a lovely, appley riesling, with great acidity, and a full rose-scented gewürztraminer. I chose the Tutti Frutti de Stéphane 2016 (gewürztraminer, pinot gris, pinot blanc and auxerrois) was a light coloured wine, with a touch of gas, round and medium full, and with a lovely acidity. Domaine Balansa has 15 hectares in Corbières. I tasted some clean, fruity wines from grenache blanc and gris, and syrah. A speciality was the Muscat 2018 aged in amphora, very light in colour, aromatic (both fruity and flowery), medium bodied, and with just enough acidity. 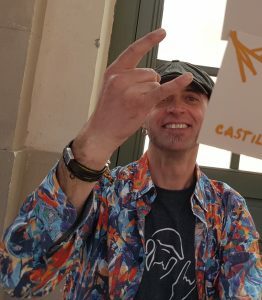 Domaine Carterole was established in Côte Vermeille (coastal southern Roussillon) by Joachim Roque. The 10-70 years old cooperative plots he had bought were transformed little by little to be able to make natural wines. 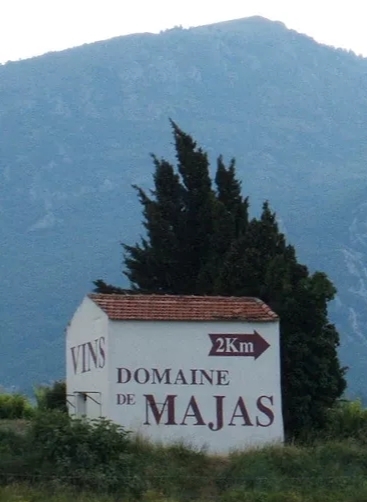 In 2014 he rented a winery in Banyuls-sur-Mer. I tasted a slighty pétillant white Ton Sec 2018, a well-balanced, but a bit on the “wild” side, apple, tea and ginger-smelling Esta Fête Le Blanc 2018, from 90% grenache blanc and the rest rousanne. An interesting wine was Vermentino Amphorae, that was light yellow, quite open, with apple, pear and citrus tones, and a slight tannin-structure. 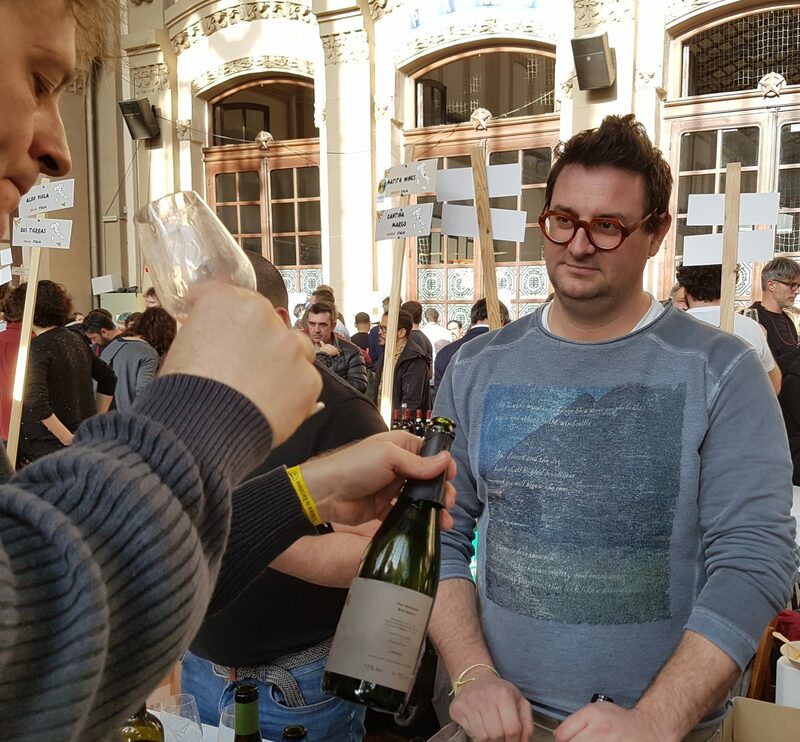 I visited Andrea following a London wine fair last year, and you can see my report here. 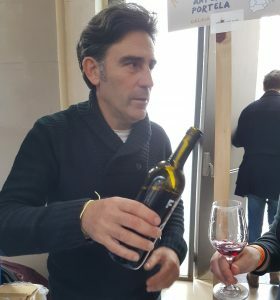 He has a creative approach, and makes several styles of organic wines from volcanic terroir in the small settlement Bernuffi (Montecchio Maggiore, Veneto region). His wines can maybe be characterized as inviting, simple, fresh, and very difficult to stop drinking. In spite of that they have a strong sence of place too. He uses biodynamic techniques, green manure and very little intervention, and of course always spontaneous fermentetion. Repeated from my article about them: ‘Basically there are two different lines. 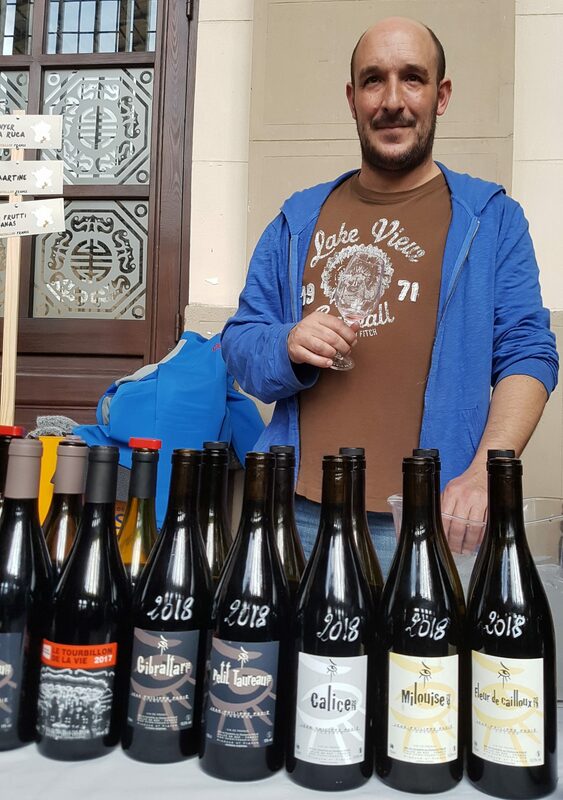 “Pop” consists of high quality “easy” natural wines from volcanic soil at a good price. “Cru” is a premium line from native varieties in clay and limestone.” Should I chose only one wine, let it be the Frizzi 2017, a pét nat, or col fòndo sur lie from the “pop” line. It’s simple, un-oaked, slightly bubbly, light salmon-pink, apple and strawberry-scented wine, not very structured, and oh! so delicious. 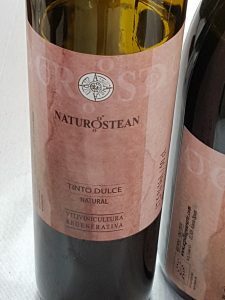 In addition to a varying content of different grapes, here pinot noir 60%, the constant is the local durella, a grape providing acidic backbone, that the vintners in the area are very proud of. Valdibella is a small cooperative operating from Camporeale, on the north side of Sicilia. They encourage biodiversity, and they concentrate on native varieties, both for grapes and other crops such as olives. Enologue Antonino Vilardi work closely with the growers. He says they want the whole chain, from grower to consumer, to share the same values, or visions, and to know about how the products are made. Therefore they can appreciate the quality, and they will understand that the products can not have a very low price. 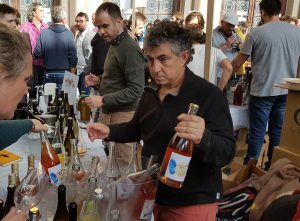 I tasted a couple of interesting grillos, Ariddu 2017, a light, grassy-citrussy wine, Grillo sulle Bucce 2017, (bucce meaning skins), so the colour was light orange, with aromas of flowers, peel, a touch of white pepper, and some bitterness in the finish. Zi bi Bò 2017 (from zibibbo, a synonym of muscat of Alexandria) is an aromatic, rose-mango-scented wine, slightly off-dry. A wine full of character was Dhyana 2017 from perricone, a light rosé of salmon colour; strawberry and redcurrant aromas; some warmth in the mouth, but also with an acidity that carries on to the end. Werner and Angela Michlits of Meinklang are found in Burgenland, Austria, in the village Pamhagen on the Hungarian border. In fact some vineyards are on the other side, and they also bottle a Hungarian wine from the volcano Somló. Here is a perfect biodiversity, vines and other crops between the natural ponds of the area. They fertilize with compost that they produce themselves, using sheep, cow and horse manure and several other components. Meinklang has a full range of very reasonably priced high-quality wines, and is mentioned in many posts of this blog. Here is one of the wine-of-the-weekend articles, where you can also see a picture of their Angus cows. Today we concentrate on their Hungarian pét nat Foam Somló 2017. The 35-60 year old vines (6o% harslevelü, 4o% juhfark) are grown on volcanic rock with a light layer of loess. The fermentation started in tank, then it was bottled with 10 grams residual sugar, and finished fermentation in bottle. No additives, no filtering. The result is a fresh, vibrant wine, low in alcohol, high in acidity. The colour is light straw, slightly turbid; aromatic, pears and peaches, some spice (white pepper); a certain warmness (or rather: a component of mature fruits like apple marmelade), but kept alive of a long, cool acidity. This is, believe it or not, another producer that we have covered more than once on this blog. Read here a report on various Czech wines tasted in England last year. I like their sparkling wines, and the Blanc de Pinot Noir 2018 wasn’t bad at all; light, with a slight blush, aroma of apples and red berries, well-structured. They offered an aromatic Chardonnay 2018, and equally convincing as before was the skin-contact, gooseberry-rhubarb-scented Gewürztraminer, now in the 2018 vintage. Our focus will this time be put on La Blanca 2018, a blend of riesling (40%), sauvignon blanc, pinot gris, and gewürztraminer from several vineyards (a total of 40%), and the last 20% is pinot blanc. The wine is partially fermented in old barrels and partly in steel. Only a minimum of SO2 is added. It’s a bit cloudy, light golden; apples pear and citrus on the nose; low alcohol, bone dry, with a steely acidity. This was my first Vella Terra, but I really want to go back, to be a part of the positive vibe that are found in the city these days. And, as Alejandra Delfino, co-founder of Vella Terra, states, “natural wines are not a passing fad, but rather a trend that has come to stay, and something that will continue to increase demand among wine lovers”. Amen to that, and we could add that while the natural wine has been something of a punk movement, I think it’s right to say that the mainstream is now moving in that direction. Texier has a natural approach, and his wines are always clean and pure expressions of grapes and terroirs. This vintage was tasted at London’s RAW fair in March 2018. It’s made from a typical Rhône blend, mainly grenache, but with some 10-15% of white grapes, that add to the elegance. Destemmed, spontaneously fermented in steel, matured in used barrel for 10 months. No sulphites added. Dark cherry red. Aromas of red fruits, raspberry, cherry, chalk, and slightly spicy. Juicy, luscious on the palate, with a touch of fine tannins, just enough acidity, and in fact quite long. 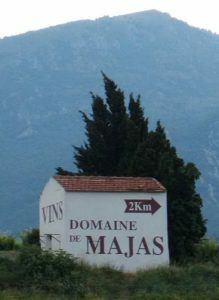 Domaine de Majas is run by Alain and Agnes Carrère. The 30 hectare domain is located in the Roussillon by the village Caudiès de Fenouillèdes. Tom Lubbe from nearby Domaine Matassa helped to change into organic cultivation. The vineyards are at 350-400 meters’ height in slopes with good exposure and drenage. We see around 120 year old vines of carignan, grenache noir and macabeu, and younger (30-35 years) of syrah, cabernet franc, merlot, rolle and chardonnay. The climate is affected by the nearness of the Pyrenees and the Mediterranean sea. The wines are fermented with natural yeasts in old cement tanks, some steel and a small percentage old, used wood. Here we experience harsh winters and warm, sunny summers. The tough northwestern wind from the Pyrenees and the wet Mediterranean breeze often follow each other. Even if the domain lies within the AOC Côtes du Roussillon they often choose to classify their wines as Vin de Pays de Côtes Catalanes, to honour what they consider te be a unique area. The soil is mainly chalky clay and schist. The grapes for this wine are grenache 50%, grenache gris 25%, and grenache blanc 25%. They were hand-harvested, naturally fermented in cement and aged there for 6 months. Light ruby. Aroma of white flowers, plums, peach and raspberry. In the mouth it’s intense, fruity with round tannins. 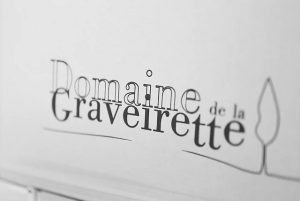 Domaine de la Graveirette is located in the Southern Rhône valley, to the east of Châteauneuf du Pape, where they also make wine of that appellation. 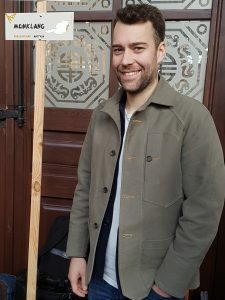 Julien Mus started the project in 2005, after finishing his studies in Burgundy. The 25 hectares of vineyards are farmed organic, and the wines now certified biodynamic. They have a freshness well above average in this part of France, and they are lovely drinking, though not at all simple. The Ju de Vie is a favourite, with all its character and lusciousness. The 2016 is made from grenache 35%, merlot 30%, marselan 25% and mourvèdre 10%, grown in sandy soils with the typical round pebbles. It was aged for 8 months in concrete tanks, and only given a tiny amount of sulphur. Dark cherry red. Aroma of red and dark berries (cherry, blackberry, plums), with notes of herbs. Luscious in the mouth, a warm touch, but there is a fresh, natural acidity too, and a good length. 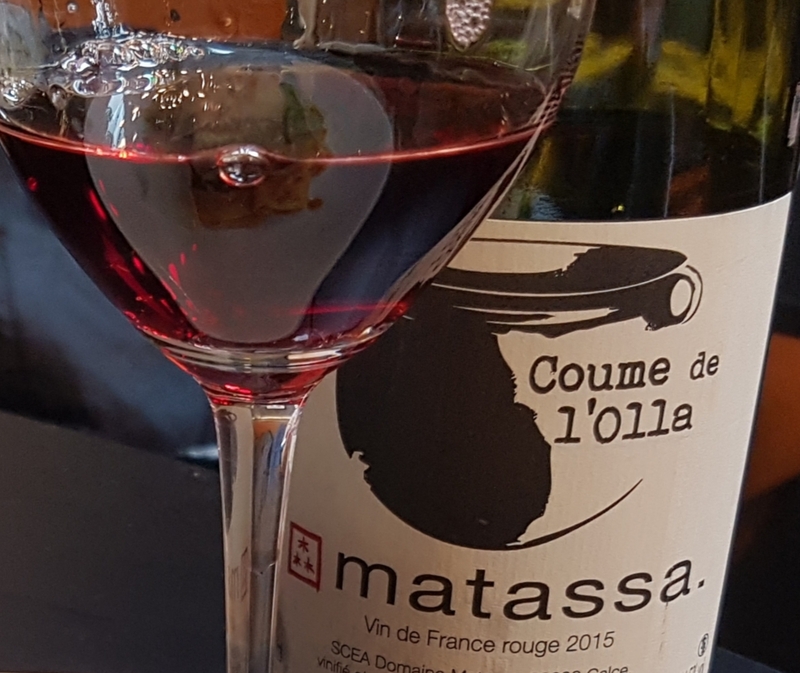 We have talked about Domaine Matassa several times. Read here about one of their white wines, and here is something from another project that New Zealand born winemaker Tom Lubbe is involved in. The white Coume de l’Olla is a lovely, citrusy skin-contact wine. Today we had the red wine with the same name at a restaurant. It’s made from grapes biodynamically farmed in the Calce region, on the northeast side of the Pyrenees. They are grenache 70%, grenache gris 20%, and macabeo 10%. The must was spontaneously fermented and aged in cement tanks. Light ruby. Aromatic, smells of red fruits, both sweet and sour (plum, cherry, cranberry), floral overtones and hints to truffles and mature cheeses too. Quite soft, fleshy, but just enough tannin to bind it together, a fresh, natural acidity and some spice in the finish. Food: Light meat, salads and much more. At an Italian restaurant we tried it today with four different dishes, and it performed brilliantly with vitello tonnato (veal in tuna mayonnaise) and pasta with a creamy sauce and mushrooms. It was some thirty years ago that I wandered through the legendary Chapelle vineyard in Hermitage. Little did I think at the time about the level of organic practice. Since then I have tasted an occasional wine, and to my taste many have been good, especially during the latest years. And it was around ten years ago that the Frey family purchased the property, and Caroline Frey took over as the new oenologist. They started converting the estate vineyards to biodynamic principles. This Côte du Rhône has its background from 40 years old vines of grenache 55%, syrah 35 and mourvèdre 10. The yields were low and it was finally raised in steel tanks. Dark purple red. Fruits from garden and woods (raspberry, black cherries, blackberry), and an amount of typical spices. Quite fresh with decent acidity. This week’s suggestion is from the Châteauneuf-du-Pape country in Southern Rhône, between Orange, Avignon and Carpentras (Vaucluse) to be more precise. 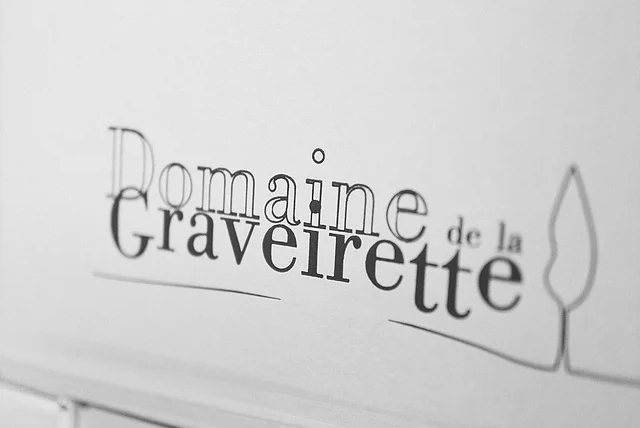 Here we find Julien Mus, who studied in Beaune, returned to his native village Bédarrides where he joined the cooperative, and then in 2005 founded his own Domaine de la Graveirette, biodynamically certified since 2015. Harvesting is done by hand, he uses no additives, except for minimal doses of sulfur. In his wines there is always a harmony of body, fruit and acidity, be it bigger Châteauneuf wines or bottlings with more “humble” designations. This particular wine is made from grenache 35%, merlot 30%, cabernet sauvignon 25% and mourvèdre 10%. The fermentation was spontaneous and carried out in concrete. Aged in steel and concrete. Dark, quite deep red. Young aroma, red and dark berries, with a slight earthyness. Quite full in the mouth, with a nice touch of acidity and some tannins. Good length. It’s good now, but I imagine it will evolve positively over the next couple of years. You might think that Antidote could have something to do with the Remedy restaurant, about which I wrote a few months ago, at least their names could suggest so. But no. They have a few things in common though, they both offer a cure against depressive tendencies, and they offer well-prepared bites, and a lot of good, healthy wines – all worked organically, many biodynamically in the vineyard. They rely on market catch, and the menu changes often. The food is quite simple, but well made, and often with both a modern touch and inspired by several corners of the world. The wine list is quite extensive, and there is a good selection of wines by the glass. They say that the wines come largely from France. That’s true, but I have spotted wines from other European countries like Italy, Spain and Slovenia, an occational one from Greece, and outside Europe too, such as Australia. I visited this cosy Soho locale twice in August, the first time with my daughter who is vegan, and they were very helpful, and gladly made some creative twists. Second time was the day after, when I had some more wines and a couple more bites. Along with their “Heritage Tomato” dish (with lemon, lovage parsley and goat’s curd) I had Ch. la Coste “Pentes Douces 2014 (Ch. la Coste), a provencal blend of vermentino and sauvignon blanc: light in colour, a rich aroma with hints of herbs, and a slightly warm touch in the aftertaste. With next bite, Spring Onions with egg yolk, comté cheese and buckwheat, I tried Clef de Sol 2014 (La Grange Tiphaine) from Montlois sur Loire, a light, fruity, mineral chenin blanc, with a lot of acidity wrapped in super fruit. Following this with the same dish I tried what turned out to be one of the stars of the evening, Maupiti 2014 (Clos de l’Elu), a light red wine from Anjou, also in the Loire. This one is made from gamay and cabernet franc. It shows lots of red berries, it’s fresh and fruity, mellow in the mouth and just delicious drinking. 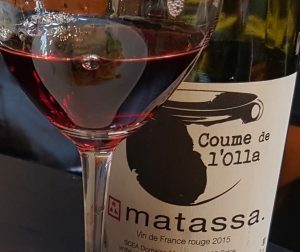 La Poudre d’Escampette 2014 (from winery Le Casot des Mailloles) is a dry red wine from Banyuls, quite unusual for the area’s image as a dessert wine region. It’s made from 120 year old grenache and 80 year old carignan vines. An unpasturized camembert from Normandie was perfectly matched with the (to a certain extent volatile) acidity of the high-hill wine. A good match was also the ossau-iraty, a sheep’s milk cheese from French Basque Country. An unusual wine to round off maybe, but excellent there and then, was I Clivi RBL 2014, a biodynamically farmed, native yeast spumante brut nature from the grape known as ribolla gialla in Friuli, Italy, close to the Slovenian border. It was dry, but rounded off, fruity, a little carbonic-mineral, and nice for washing away what might remain of the fat from the cheeses. This week’s pick comes from a winery that never converted to organic growing. 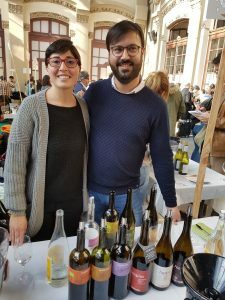 It wasn’t necessary because it has always been, as they count on a history of five generations and 200 unbroken years of making natural wines. They were also key figures in establishing the AOC for Bandol during the German occupation. 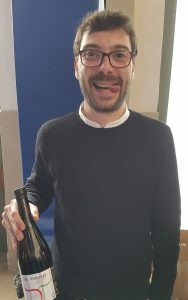 François Dutheil (father to current owner) was one of the people behind AVN (l’Association des Vins Naturels), where Marcel Lapierre of Beajolais participated and soon became a leading figure. The only ingredient except for the grapes is SO2, only in tiny amounts and only in the vineyard against fungus. The vineyards of Bandol lies for a great part on south-faced terraces in the in-land from the seaside town that gives the wine its name. As for the rest of the region rosé is dominating in quantity, around 80% even here. And much wine is classified as Côte de Provence. Myself I am drawn towards the red wines of the region, often a bit mystic, not lightweight, neither heavy and «clumsy». They can have a fresh fruit, but they are never sharp. They have long oak-ageing, often more than the obligatory 18 months. But the best will never smell of wood, as they are subject to a treatment in big, used foudres that make them «breathe». At Ste. Anne, red is the most important wine. The mourvèdre grape is king. Just like its equivalent monastrell on the Spanish Levante coast Bandol is one of the few places where you can be sure that the grape will mature. But still the general alcohol levels in Ste. Anne’s range of wines are low. This is due to the special microclimate below the Gros Cerveau peaks, that gives very cool summer nights. The cold air is accumulated because of special metheorologic phenomena between the mountains in the area. The tannins are soft and rounded. Mourvèdre is harvested later here than other places, around mid-October. It must be fully ripe, otherwise the wine will be hard and bitter. A way to understand when the time is right, according to Raphaël, is that the skin is no longer elastic and that the pips are brownish. The Bandol 2010 is made from 60% mourvèdre, and equal parts of grenache and cinsault. This is their main wine, and 30.000 bottles are made. Their bandol stays 20-22 months in foudres, and the various vintages are released when they are considered «ready». As a result the 2003 was released after both ’04 and ’05. Deep purple in colour. Very complex aroma of red fruits (raspberries), flowers, balsamic notes (red lickorice), combined with some mineral notes. There is a slight touch of volatile acidity too, that is by no means disturbing, but in my opinion it adds to the freshness. Medium to full body. When I last tasted this wine, at the winery before the release, the tannins were more evident, now everything is in perfect harmony. Mature, but will keep. Food: Beef, game, duck and other full-flavoured meat. Cheese, both manchego type and some blue cheeses. Fiona Beckett writes about steak pie that red bandol can be a perfect choice. The possibilities are endless. And the first 100% organic village for agriculture is Correns, in the inland from the Azur coast between Nice and Marseille. Much has been said about this property and its affinity to artists throughout the years. Briefly: In 1970 jazz pianist Jacques Loussier used it as a recording studio. (Parts of Pink Floyd’s The Wall are recorded here.) Today it’s owned by actors Jolie & Pitt, and the wine is made by Perrin, the family behind many outstanding wines like Beaucastel. Covering 500 hectares of land in the Côte de Provence, the wine château is only a small part of this, together with olive groves, woods and wildlife. The vineyards are located around 350 meters above sea level, partly terraced, on clay and limestone soils. The temperature varies a great deal between day and night, given a nice freshness to most of the wines. Most of the grapes are lightly pressed directly. But some of the syrah are made according to the “saignée” method, which means that part of the juice is removed from the must to concentrate phenolics and other components. (Needless to say, it’s not an ideal practice with “naturalists”.) The fermentation was mostly in stainless steel, with a small part (around 5%) in oak, with some batonnage. Pale pink. Delicate aromas of citrus, raspberries and white flowers, and a touch of pepper. Quite fresh on the palate, some volume too and a nice concentration that makes it persistent, with a dryness and a touch of a salty minerality in the finish. I find that many of the rosés in the area have too much alcohol for the body and concentration. This one not.